If you were going to brew an India Pale Ale and could choose one person in the world to help you do it, Mitch Steele might just be your man. He’s the brewmaster at Stone Brewing, the famed American brewery whose name can barely be spoken without the letters ‘I’, ‘P’ and ‘A’ following immediately afterwards. This is a man who not only oversees the production of some of the most iconic IPAs in American brewing, but has gone so far as to write a book about the style. So when Mitch came to Sydney in February as part of the launch of Stone’s official distribution to Australia, he spent a few days hanging out with the Nomad Brewing team and, wouldn’t you know it, they coaxed him into the brewery where he and Nomad brewer Brooks Caretta knocked up an IPA. The way they described how it came about makes it seem so casual and overly simple: “Oh, you know, a couple of emails, a bit of this, a bit of that – whatever’s lying around” kind of thing. But when you know your hops like the back of your oily, resiny, fragrant hand, that’s the kind of luxury you have. What they ended up brewing was a Red Rye IPA which has, as well as the obvious rye malt, two American hop varieties (Cascade and Centennial), two Australian (Galaxy and Vic Secret) and one from New Zealand (Nelson Sauvin). They were added in plentiful supply with the idea being that they’d come in over the top of the peppery/spicy characters of the rye and deliver a big hop hit, in true West Coast US style. 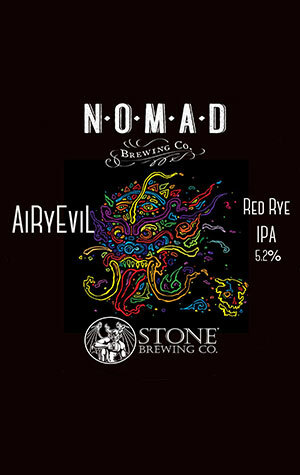 The beer’s name, AiRyEvil, is not only a solid attempt at destroying the beauty of the written English language, but also a solid collaborative effort at nailing the brewing requirement for puns while also offering up genuine meaning: ‘AiR’ is a homage to Nomad’s globe-trotting nature, ‘RyE’ is for the style and ‘Evil’ represents the wickedness of Stone’s gargoylian logo. Kegs initially. Bottles to follow.